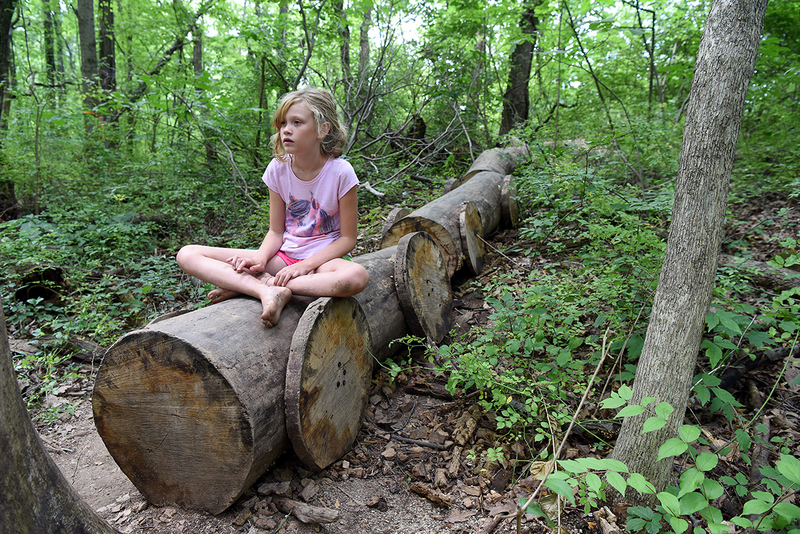 The best places to play are those where you can use your imagination, as we did during a recent visit to the Natural Playground, a 10-acre space at Blendon Woods Metro Park in Westerville. 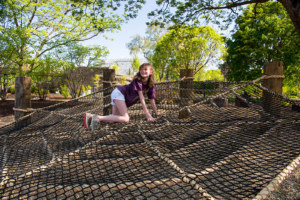 As we climbed on a net amid trees, we pretended to cling to a spider’s web, hot lava bubbling beneath our feet. We then scurried across a log bridge as angry trolls threw mud pies at us. 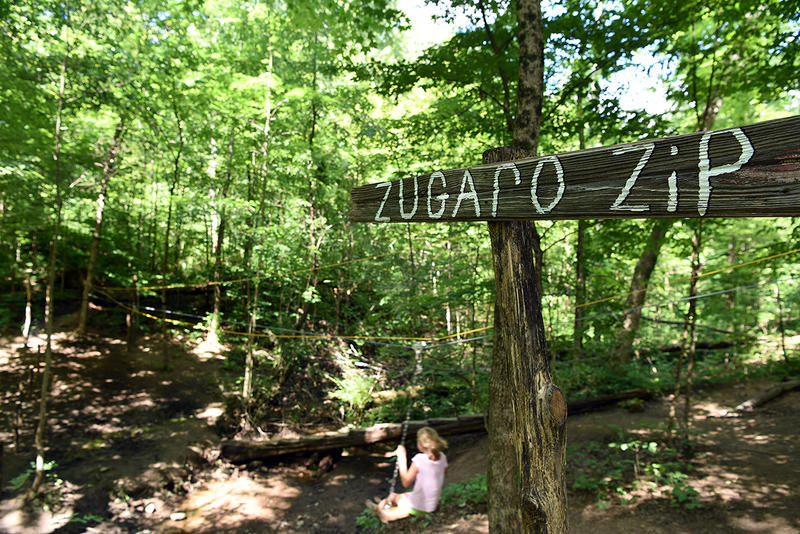 Later, we hopped on a hillside zip line, narrowly escaping the clenches of a make-believe forest beast. 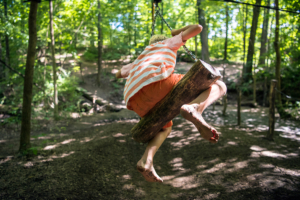 There are intentionally no posted rules or regulations at the Natural Playground to hinder creative play. If you want to leap from a vine while pounding your chest like Tarzan, go for it. 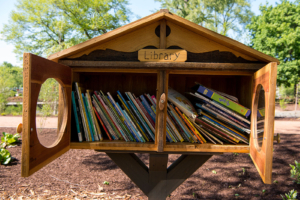 There’s a vine for doing just that. 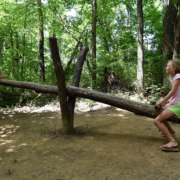 There’s also a teeter totter made out of two hunks of wood, a pile of limbs for building forts and fairy houses and a train made of logs. 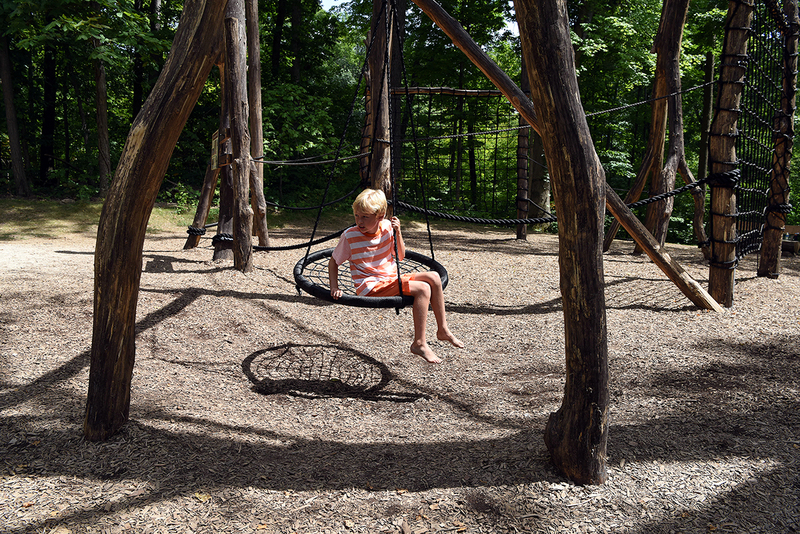 The park opened in May 2017, inspired by the bond between a little girl named Maris and her dad, Tim, who’d frequented Blendon Woods. Tim Zugaro died in a car accident in 2016. 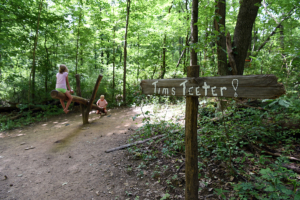 Tim’s wife, Michele, contributed donations from his funeral to build the play area. Memories of Tim abound, including a couple of wooden posts that read Tim’s Teeter and Zugaro Zip. 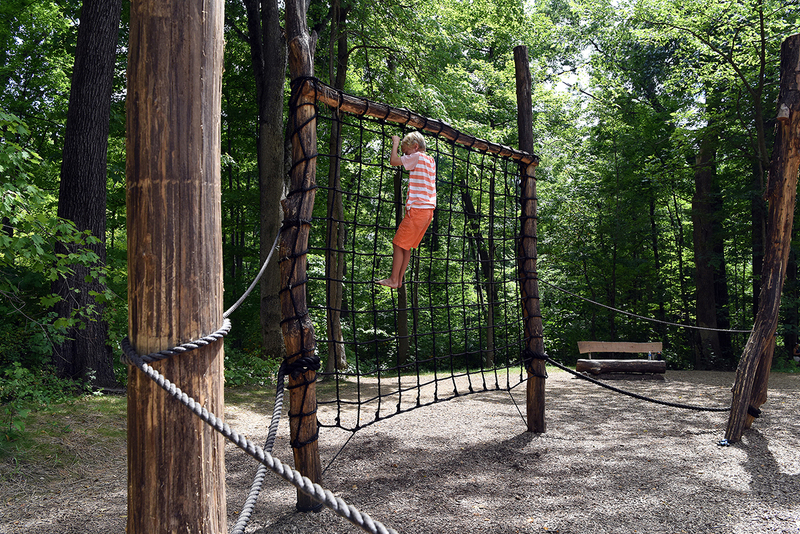 The space is delightfully unstructured, a place where kids are encouraged to get off the trodden path to play in the dirt and climb trees. 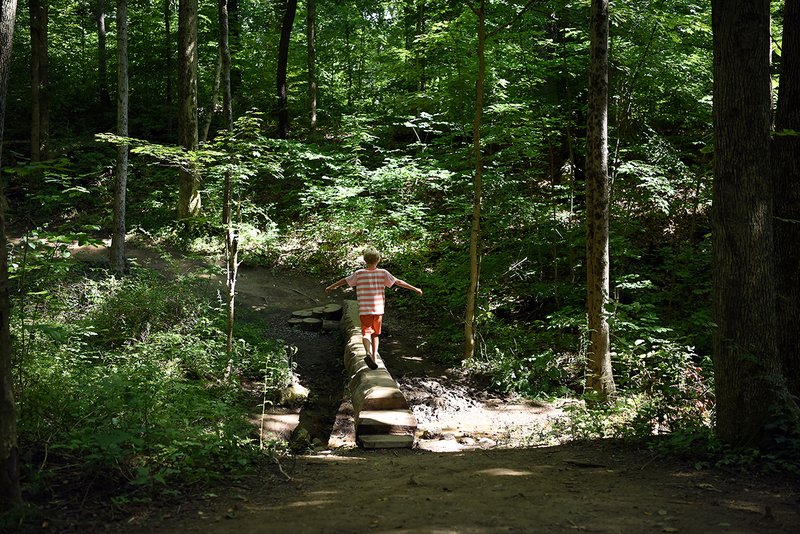 Learn more about Blendon Woods. 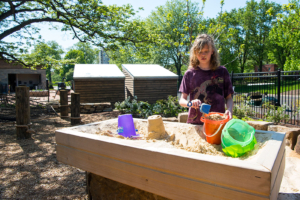 Well before the first shovel of dirt was turned for its new children’s garden, Franklin Park Conservatory and Botanical Gardens asked kids what would make the place a success. Their answer: Rainbows, waterfalls and room to climb. 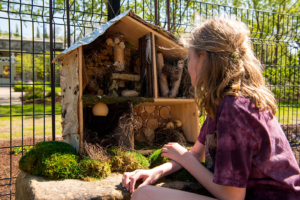 The Scotts Miracle-Gro Foundation Children’s Garden has that in abundance, as well as a fairy garden and library, a straw bale playhouse, a wetlands display, a sandstone bluff, a rope bridge, even a human-sized cardinal’s nest. 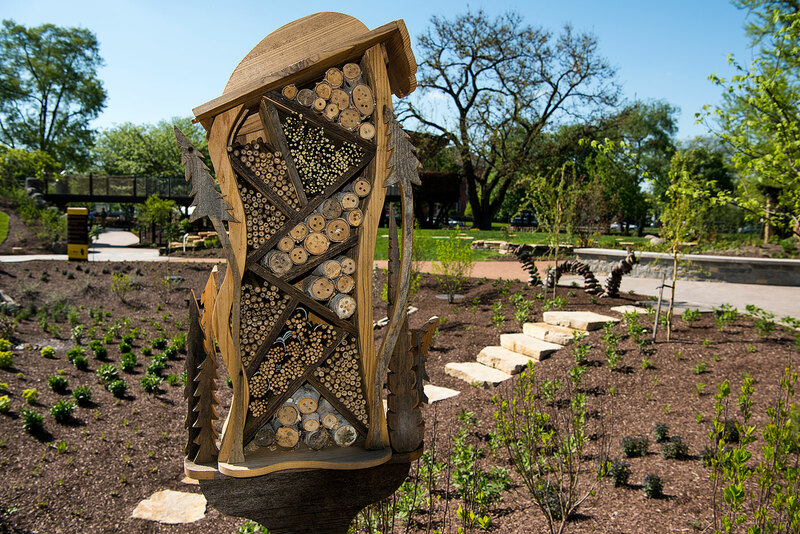 When it opens on May 19, the children’s garden will highlight an expansion of the conservatory’s downtown grounds that was years in the making. 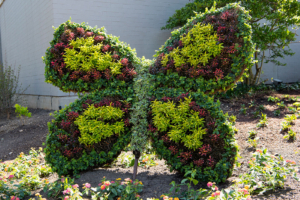 Well-established as a premier floral attraction that caters mainly to adults, the conservatory, founded in its present form in 1993, now has the goods to make kids think twice about spending an afternoon tied to a screen. 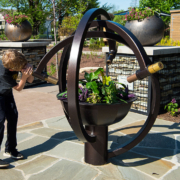 The conservatory set aside $5.7 million to build the garden, which was designed by Terra Design Studios of Pittsburgh. 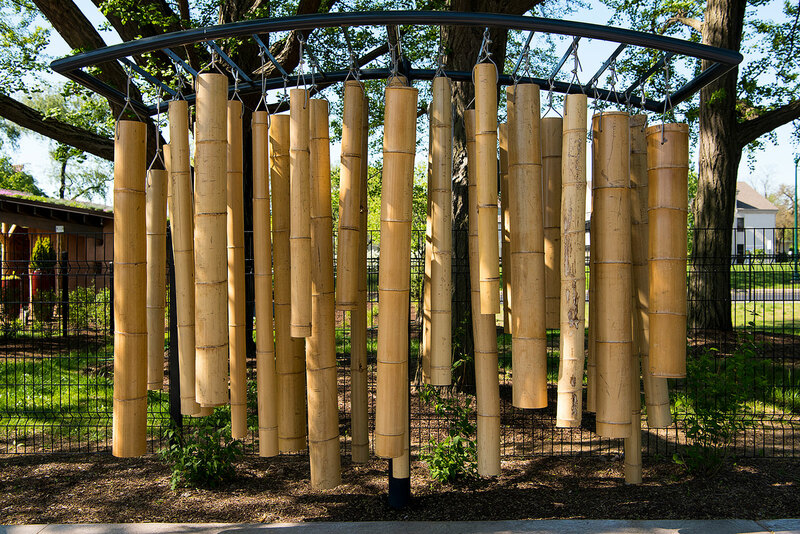 It covers 2 acres on the conservatory’s 40-acre campus (an adjoining 48 acres owned by Columbus makes up Franklin Park) and offers 16 galleries all with unique perspectives on nature. 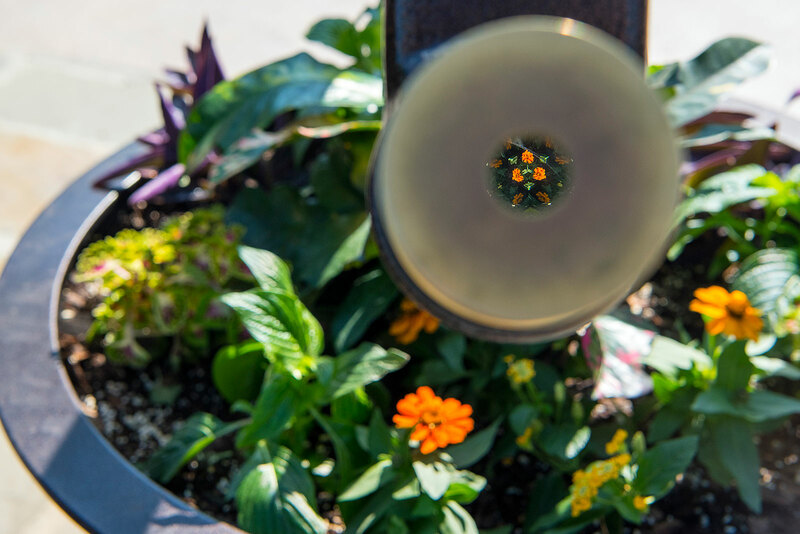 While the garden takes advantage of existing flora, including a majestic mulberry tree, the conservatory added an astounding 19,000 new plants to bring it to life. “This is the largest botanical project the conservatory has undertaken,” Wilson says. 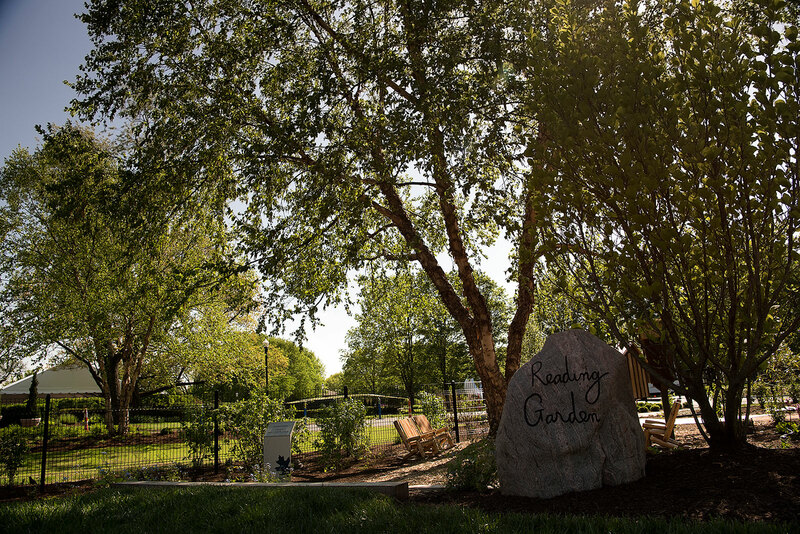 The garden will be staffed from April through October, so there’ll be plenty of regular educational offerings, such as a community garden that will allow participants to plant, cultivate, harvest and prepare vegetables. 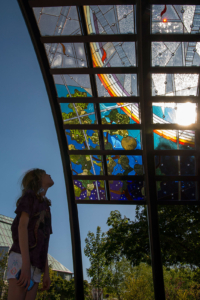 Kids love rainbows, so the first thing visitors will see is a rainbow arch made up of 56 stained glass panels. It’s a nod to Columbus’ reputation as the “Arch City,” thanks to the metal arches that stretched over some of its downtown streets. In each pane, embedded crystals will sparkle in the sun, and rainbows will appear on the ground. 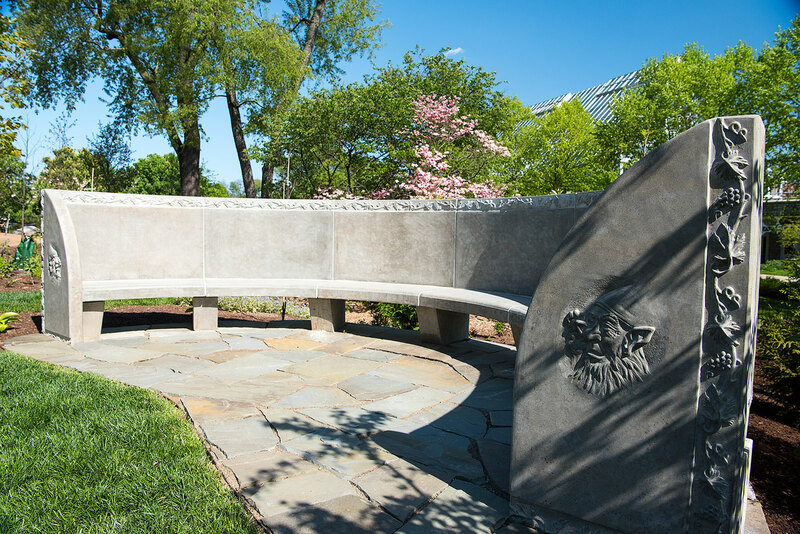 The garden’s rainbow welcome terrace includes seating walls embedded with glass to mimic rainbows. Nearby, boulders will emit a rainbow-colored mist when the sun shines just right. 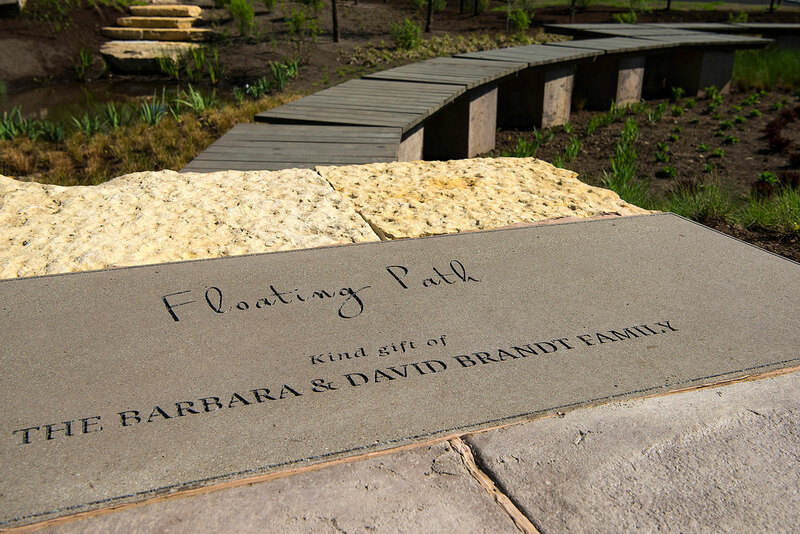 A highlight of the garden is a 150-foot-long sandstone creek built for wading when the weather turns warm. 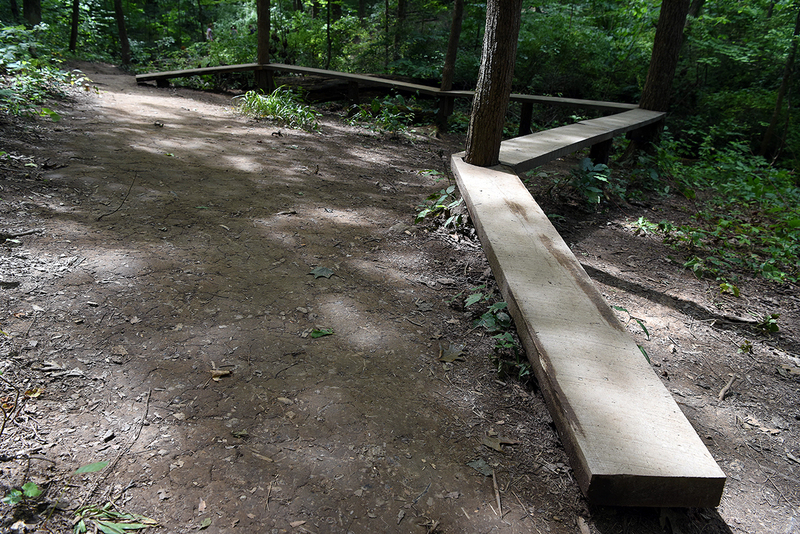 It includes a boardwalk perched above a wetlands exploration area, which is actually a small water retention pond. Kids will learn about environments and life cycle by observing the critters sure to make a home in the pond. 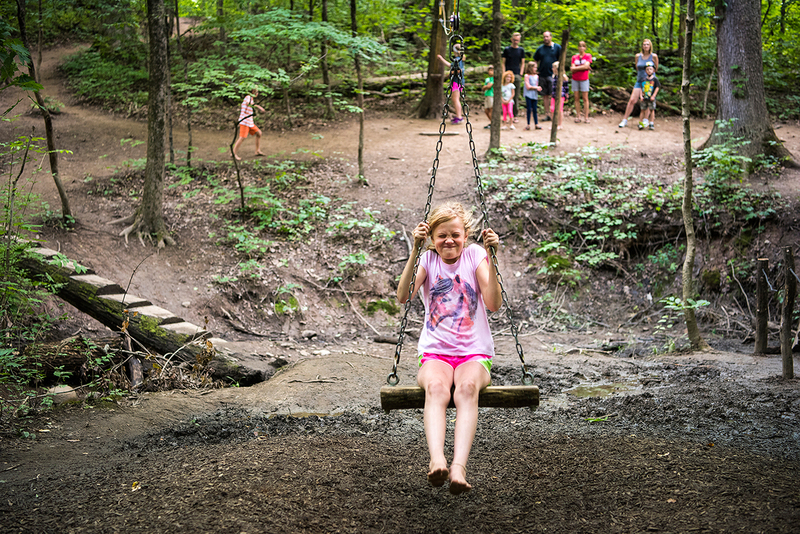 One of the first attractions you’ll see after passing through the rainbow arch is a canopy walk, a covered walkway from which kids can spot a spotted salamander design in the concrete. Further exploration along the canopy walk will bring them to the human-sized cardinal’s nest, steadfastly weaved by conservatory staff. Nearby is a hammock lounge, hovering over a garden of plants below. 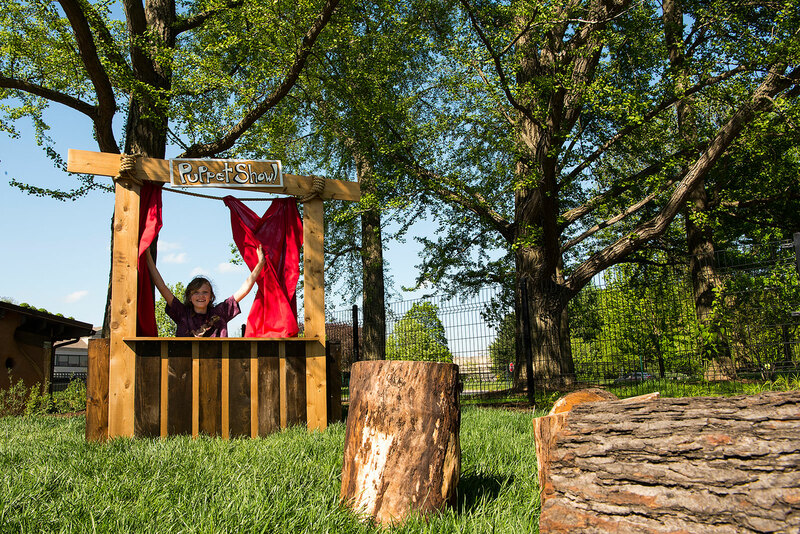 The conservatory’s believes the children’s garden will help double its annual paid attendance of 100,000. 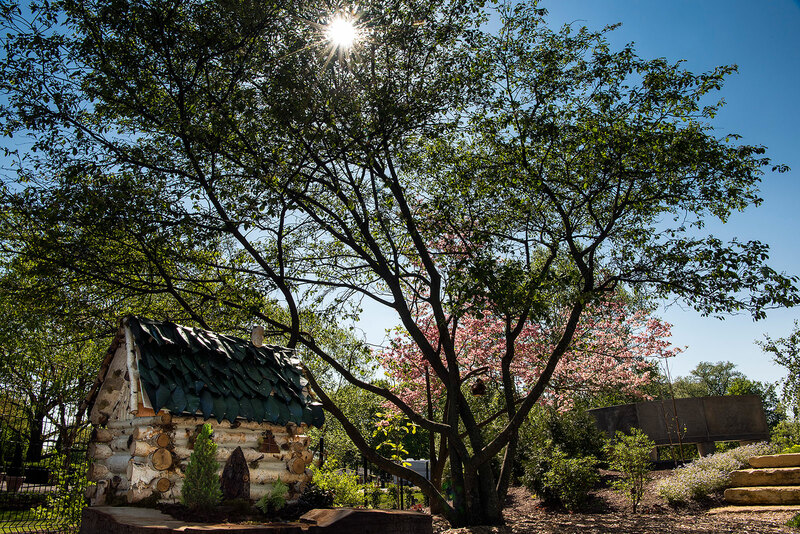 The Scotts Miracle-Gro Foundation Children’s Garden is located at the Franklin Park Conservatory, 1777 E. Broad St., Columbus, OH 43202. The park is open daily, except Thanksgiving and Christmas Day, from 10 a.m.-5 p.m. 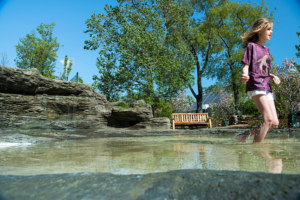 Admission to the children’s garden is included with admission to the conservatory. 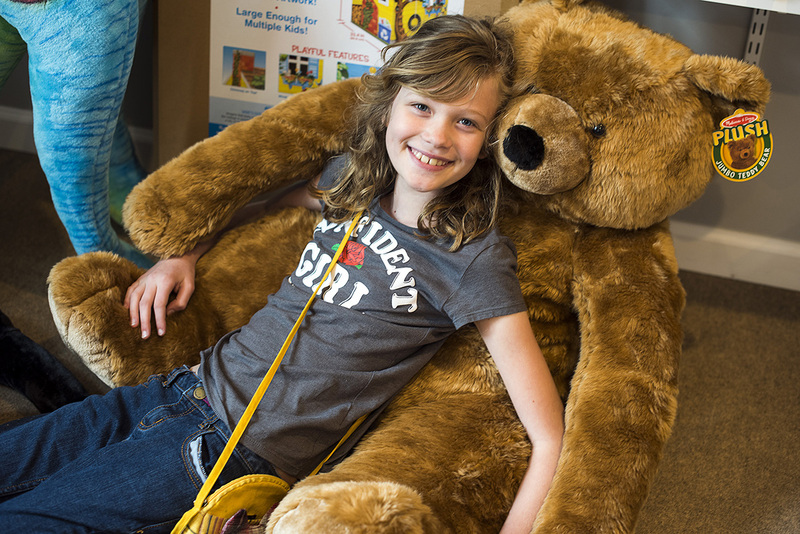 Cost: ages 13-59, $18; age 60 and over, $15; ages 3-12, $11; under 3, free. Call 614-715-8000 to learn more. Be it beer, wine, doughnuts or chocolate, we’re suckers for organized trails. 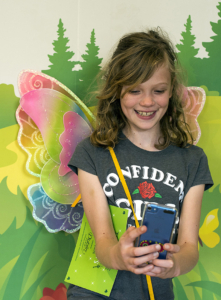 So when I recently learned of a fairy trail in downtown Dublin, my daughter, Rosie, and I made plans to check it out. 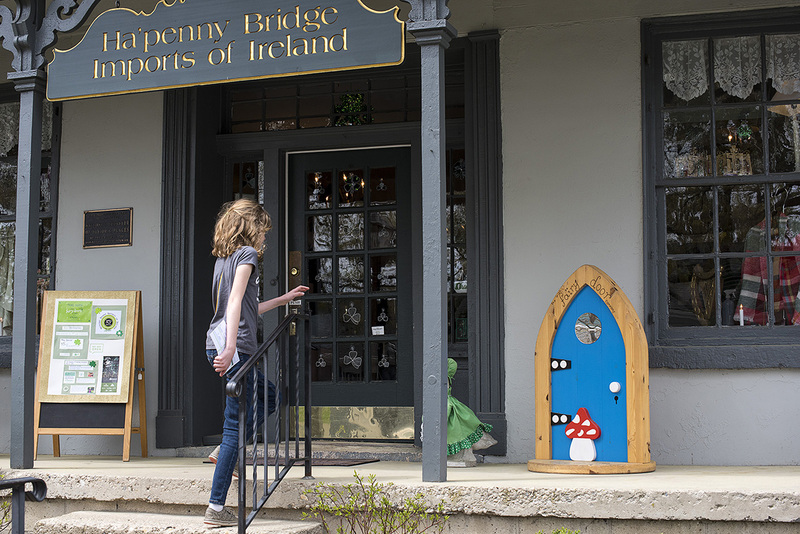 The Irish Fairy Door Trail was created in 2016 by the Dublin Convention & Visitors Bureau as a fun way to highlight the independent businesses in downtown Dublin. 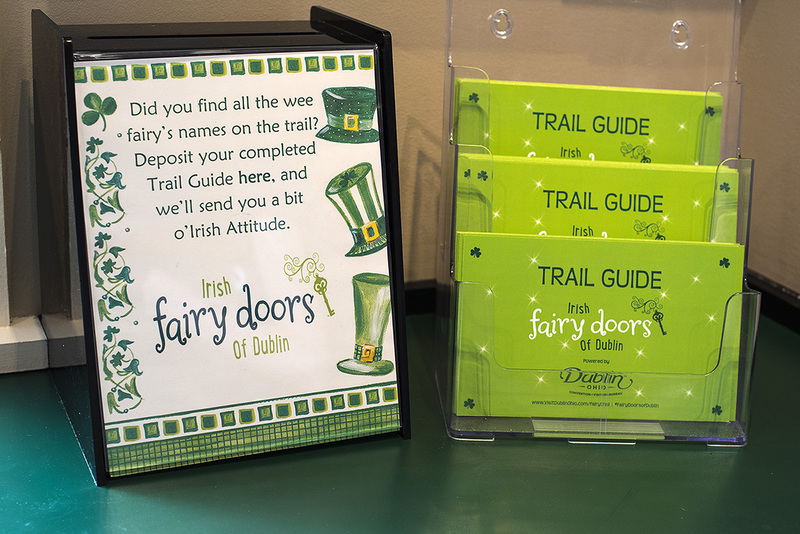 Trail guides are available online or can be picked up in person at the Dublin Visitor & Information Center at 9 S. High St. 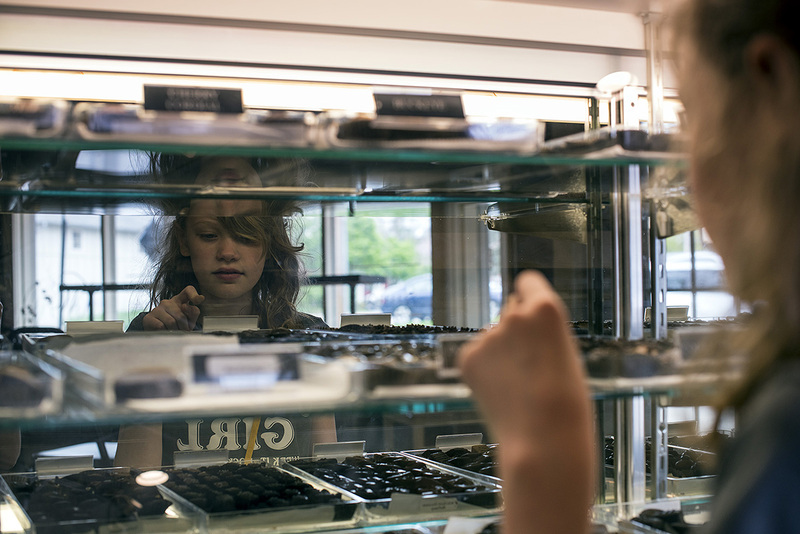 The center is open daily from 8 a.m.-9 p.m. 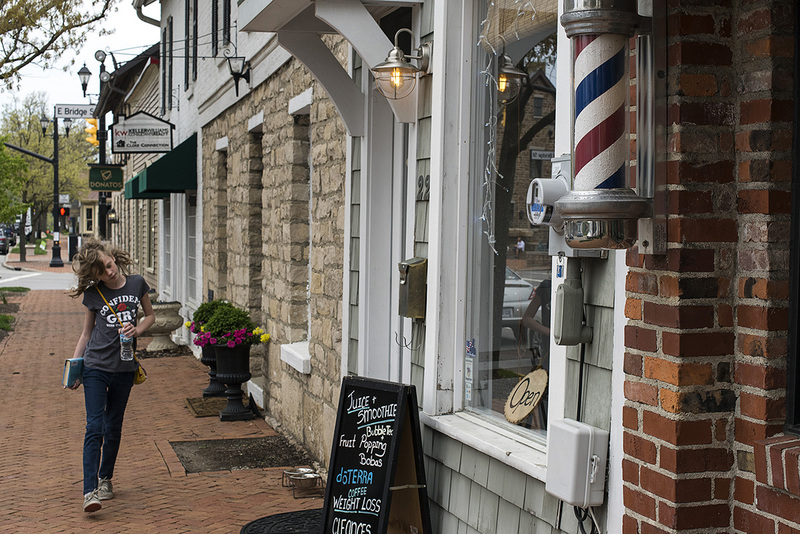 Eight small, glitter-encrusted doors have been hidden inside an equal number of businesses in the historic downtown area. 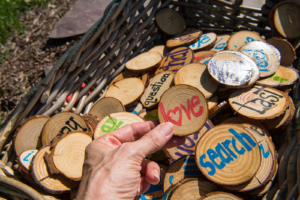 It’s up to participants to find them and take note of the fairy’s name that’s been attached to each. 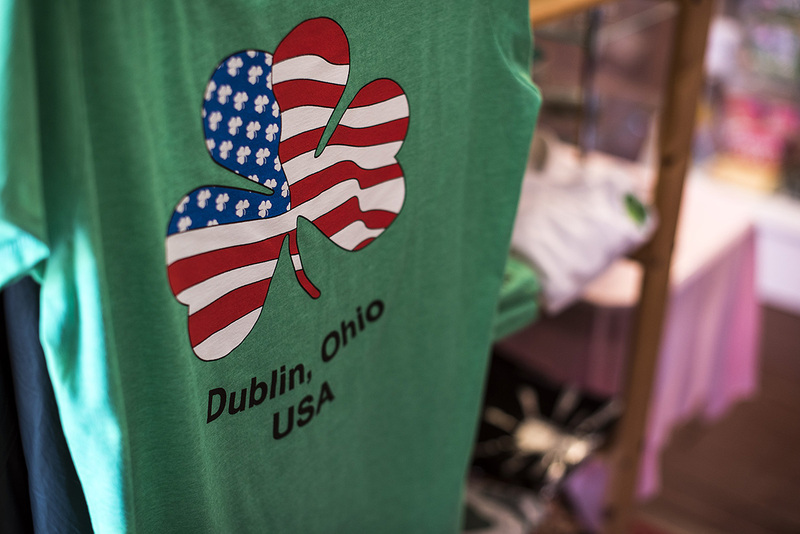 Jot down the names of the fairies found at six of the eight participating stores on your passport to earn an Irish Fairy Door Trail T-shirt. Completed passports can be slipped into a box inside the visitor’s center. The real prize, Rosie and I discovered, was spending time together exploring the unique stores. 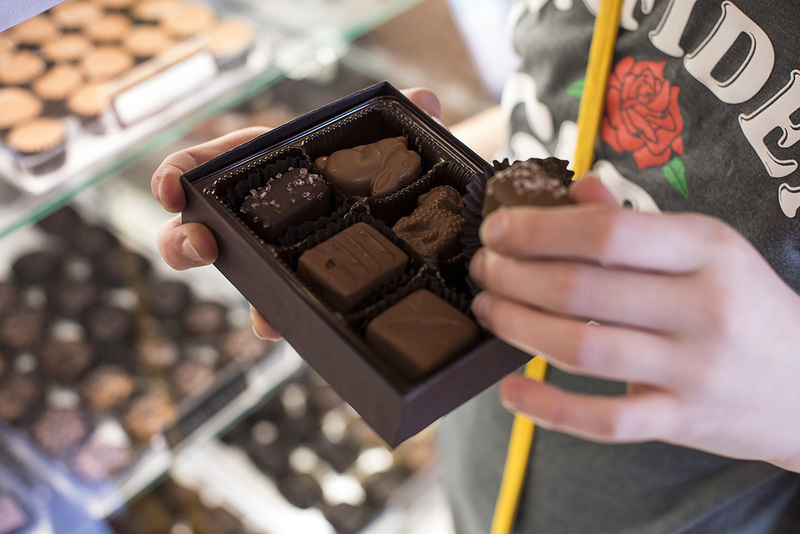 I drank coconut-flavored coffee and devoured sea-salt caramels at Winans of Dublin. Rosie found a shamrock-spotted rubber duck at Ha’Penny Bridge Imports of Ireland and a comfortable seat in a giant Teddy bear at the Dublin Toy Emporium. 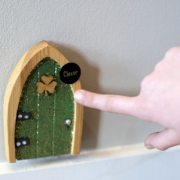 Learn more about Dublin’s Irish Fairy Door Trail. Also check out Dublin’s new Celtic Cocktail Trail, and Dublin’s Art in Public Places Tour. 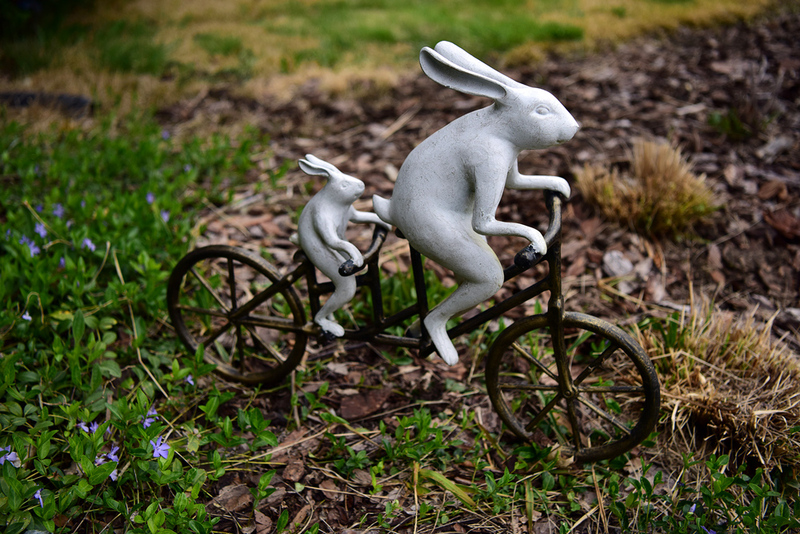 Pat Barron wants you to think of rabbits as companion animals, just like cats and dogs. 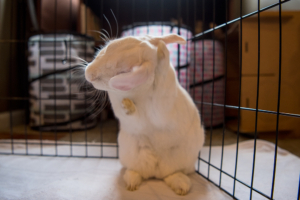 As a volunteer at the Ohio House Rabbit Rescue in Columbus, Barron spends a lot of time introducing humans to rabbits in the hopes that she’ll pair a hare with a forever home. Each year in Ohio hundreds of unwanted pet rabbits are surrendered to animal shelters or released into the wild. 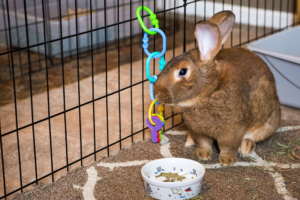 The Ohio House Rabbit Rescue seeks a better alternative for these abandoned rabbits – one that includes unconditional love, a proper diet and regular veterinary care. 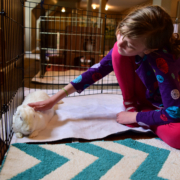 More than 100 rabbits are adopted annually through the program at a cost of $40 per bunny. 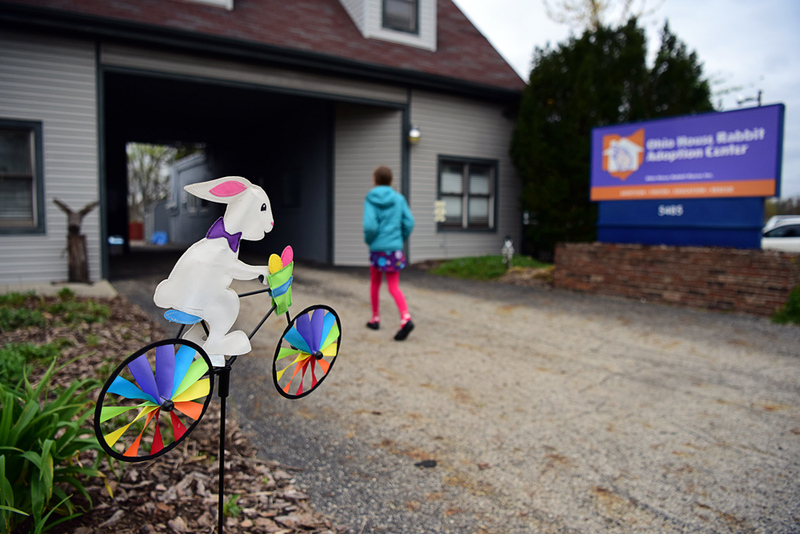 The rescue opened in 2013 in a 4,000 square-foot-space that’s overseen by a volunteer staff. It includes an intake area, treatment room and lots of play space. 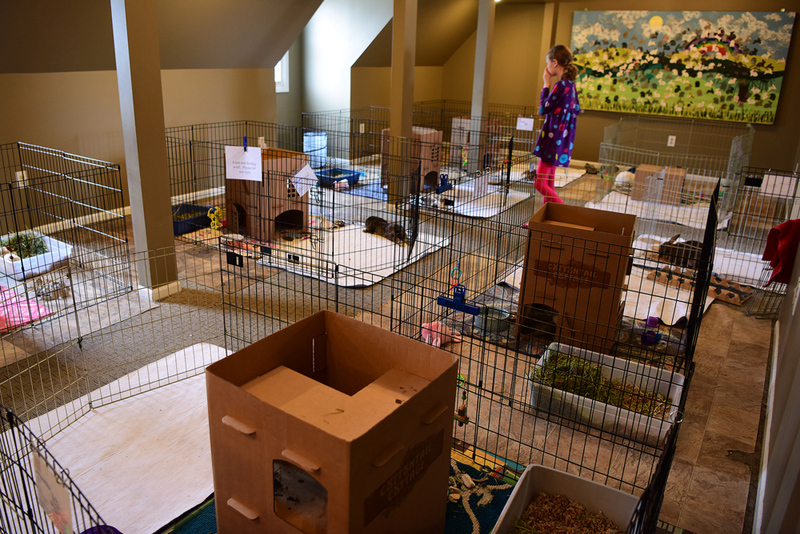 Each bunny has its own 4-by-4-foot pen containing a cardboard shelter, litter pan, toys and food. 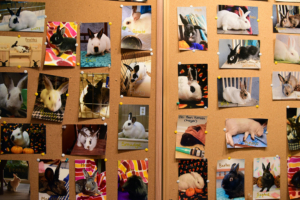 The staff is happy to tell you about rabbit ownership and match you to the rabbit that best fits your personality and home environment. 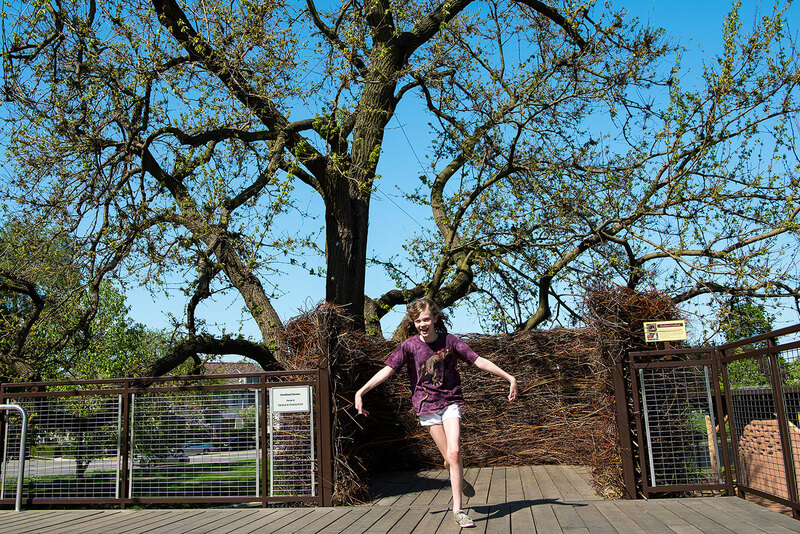 Barron hops over a side of an enclosure. Like a magician, she lifts the cardboard box, revealing a black rabbit with bright eyes and twitching whiskers. 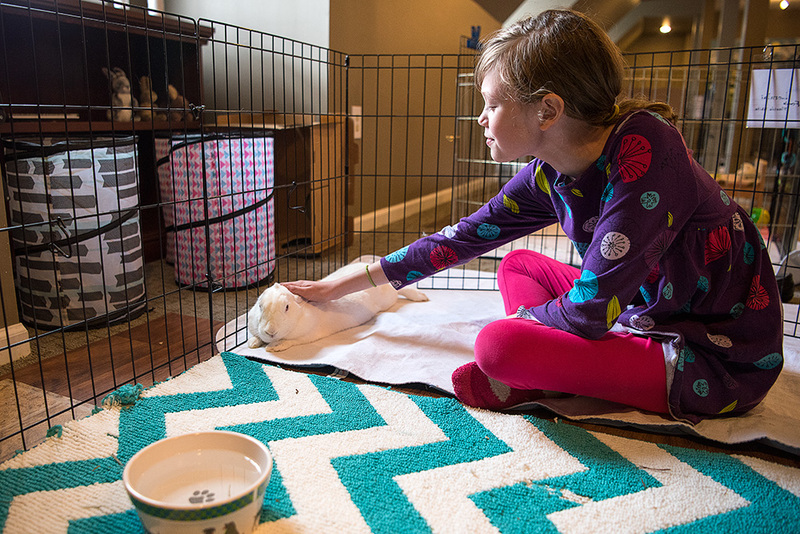 Visitors are taught how to socialize the rabbits so they’re more adoptable. 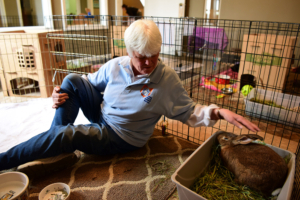 Volunteer opportunities exist, too, including the position of “bunny socializer” – people who simply spend time with the rabbits, talking to them and petting them. Barron teaches us the proper technique for petting bunnies. We start at their foreheads and stroke backward, focusing our attention on their ears. “Don’t pet their noses or their behinds,” Barron says. “They don’t like that. We also learn that they don’t like it when people make cartoony rabbit sounds, wave their hands in front of their faces, try to feed them hay or play with their toys. Ohio House Rabbit Rescue is located at 5485 N. High St., Columbus. 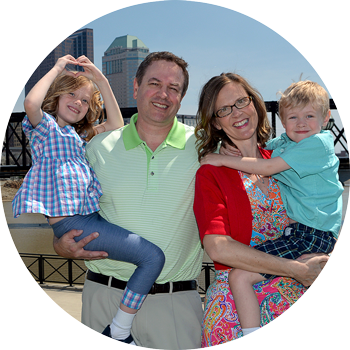 Public visiting hours are 5:30-7:30 p.m. Wednesday; and noon-4 p.m. Saturday and Sunday, or by appointment by calling (614) 263-8557. 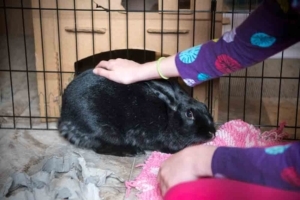 Visitors who wish to interact with the rabbits should be at least 8 years old. 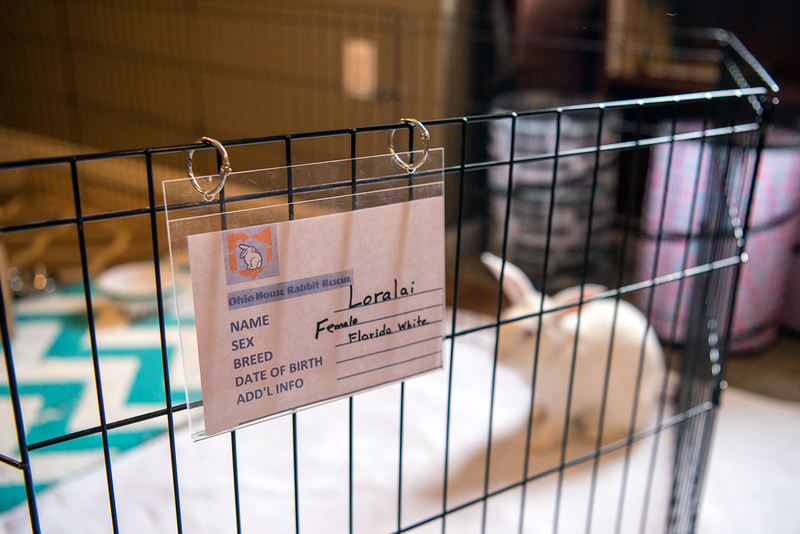 Learn even more about bunny ownership at the Midwest BunFest in October.